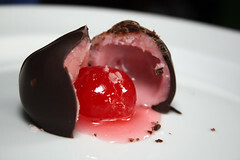 Last time on As the Fondant Liquefies, we made cherry-flavored fondant and dipped maraschino cherries in it, in preparation for dipping them in chocolate. Really, that’s the hardest part of the whole process. This entry was posted in Christmas, Confections, Gifts and tagged cherries, chocolate, chocolate covered cherries, Christmas, invertase on January 2, 2009 by Jessica Petersen. In the interest of tracking how quickly the invertase liquefies the fondant, I decided to dissect and photograph them before taste testing each day. After (not quite) twenty-four hours, the invertase and cherry juice have converted the fondant immediately around the cherry to liquid, but most of the fondant is still firm and attached to the chocolate coating. This entry was posted in Christmas, Confections and tagged cherries, chocolate, chocolate covered cherries, Christmas, Confections, Gifts, invertase on December 22, 2008 by Jessica Petersen.